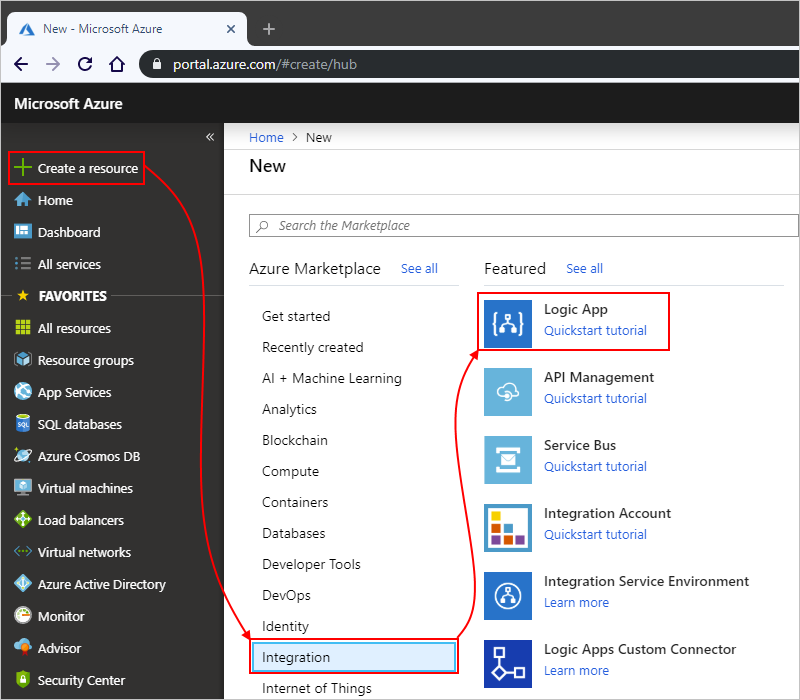 Azure Logic Apps helps you automate workflows and integrate data across Azure services, Microsoft services, other software-as-a-service (SaaS) apps, and on-premises systems. 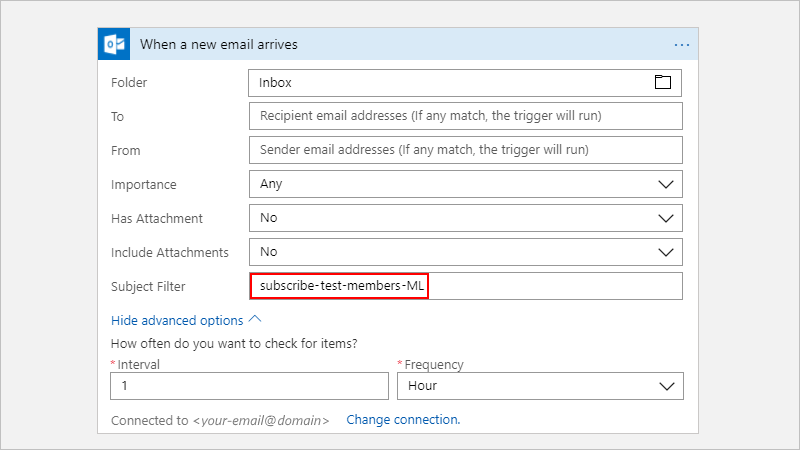 This tutorial shows how you can build a logic app that processes subscription requests for a mailing list managed by the MailChimp service. This logic app monitors an email account for these requests, sends these requests for approval, and adds approved members to the mailing list. Create a blank logic app. 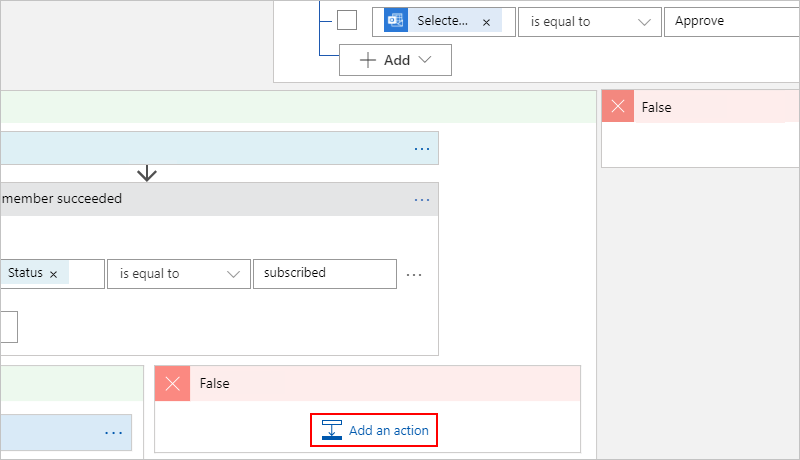 Add a trigger that monitors emails for subscription requests. 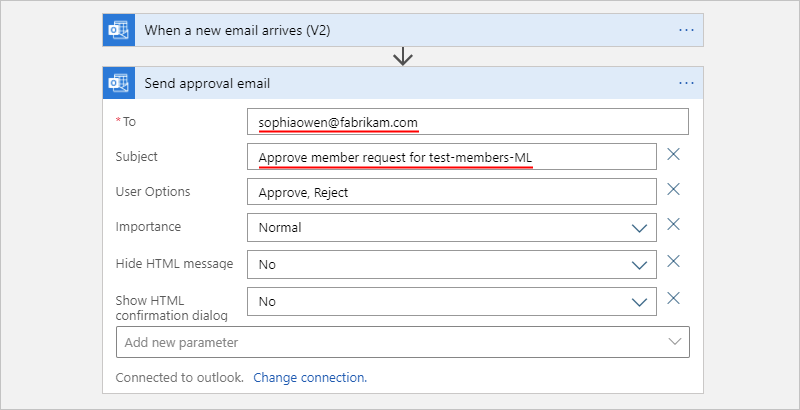 Add an action that sends emails for approving or rejecting these requests. Add a condition that checks the approval response. Add an action that adds approved members to the mailing list. Add a condition that checks whether these members successfully joined the list. 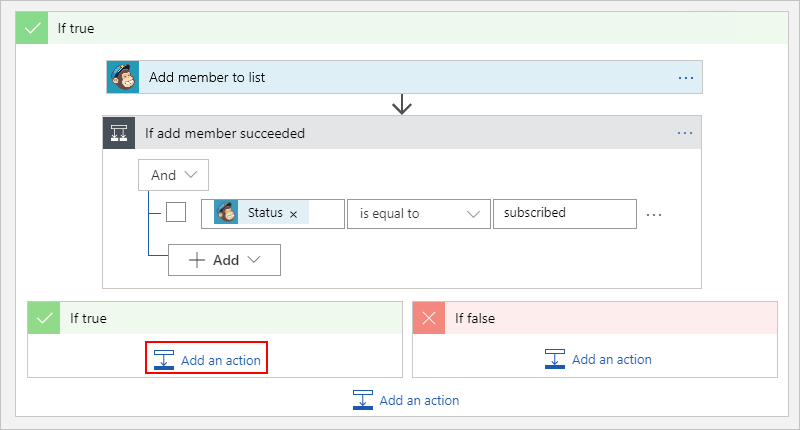 Add an action that sends emails confirming whether these members successfully joined the list. If you don't have an Azure subscription, sign up for a free Azure account before you begin. A MailChimp account. 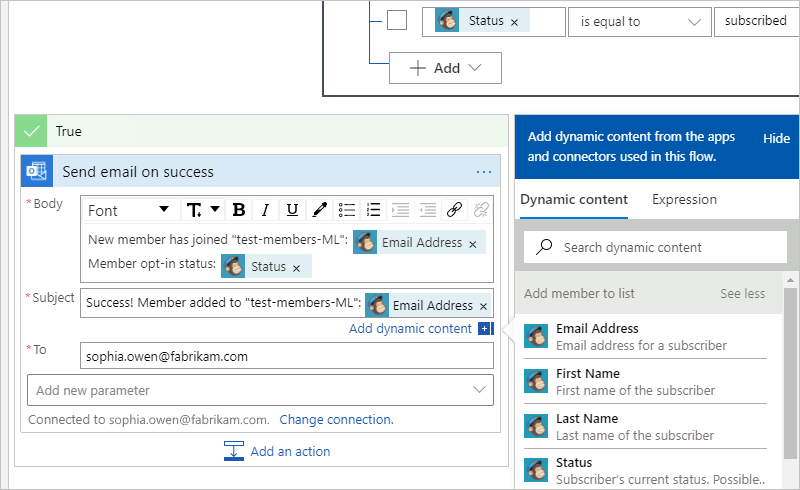 Create a list named "test-members-ML" where your logic app can add email addresses for approved members. If you don't have an account, sign up for a free account and learn how to create a list. 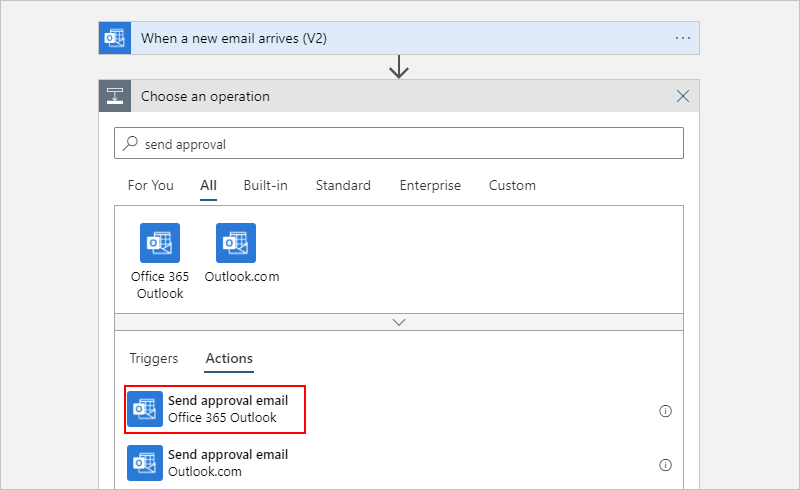 An email account with Office 365 Outlook or Outlook.com, which support approval workflows. 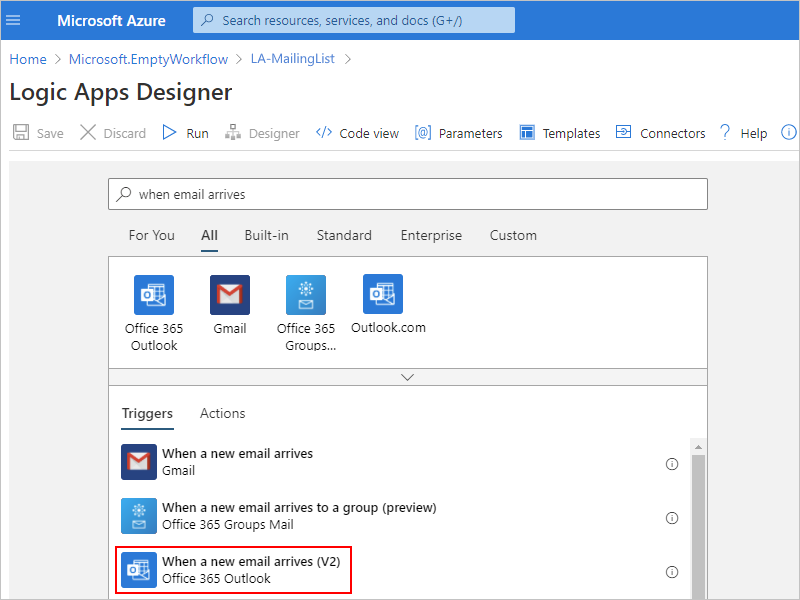 This article uses Office 365 Outlook. 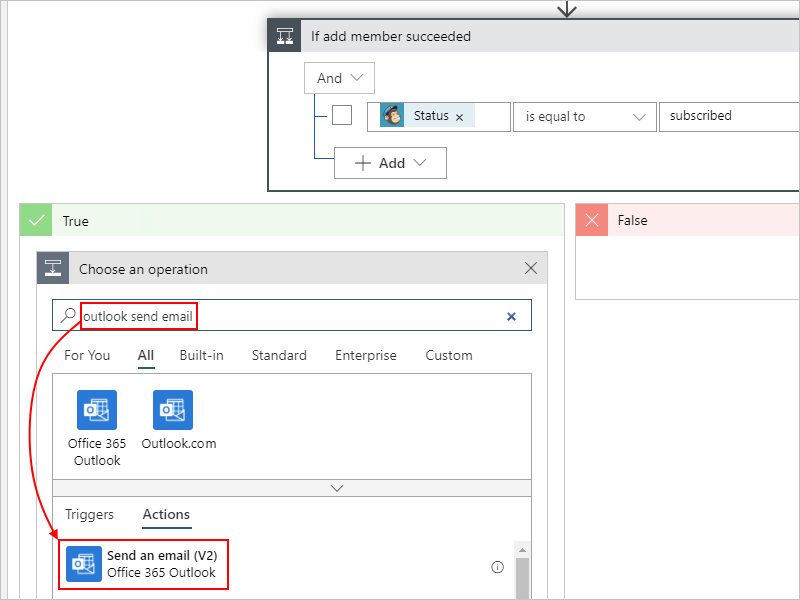 If you use a different email account, the general steps stay the same, but your UI might appear slightly different. 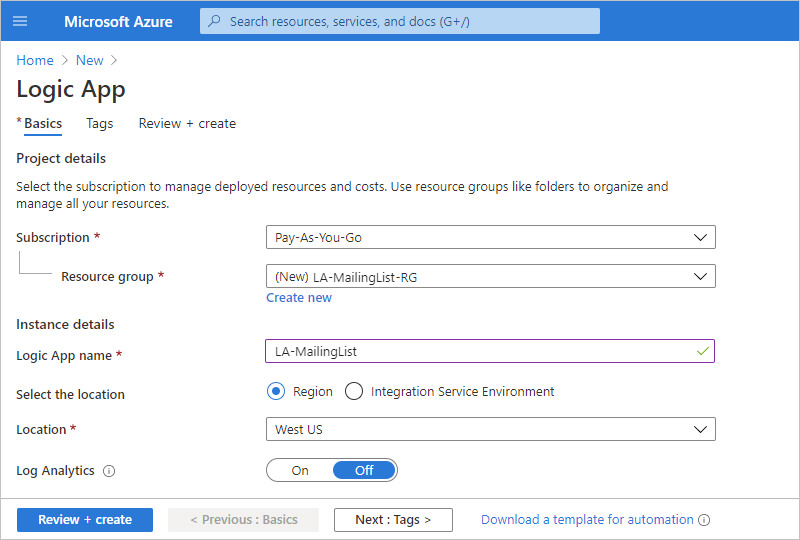 From the main Azure menu, choose Create a resource > Enterprise Integration > Logic App. Under Create logic app, provide this information about your logic app as shown and described. When you're done, choose Pin to dashboard > Create. Log Analytics Off Keep the Off setting for diagnostic logging. 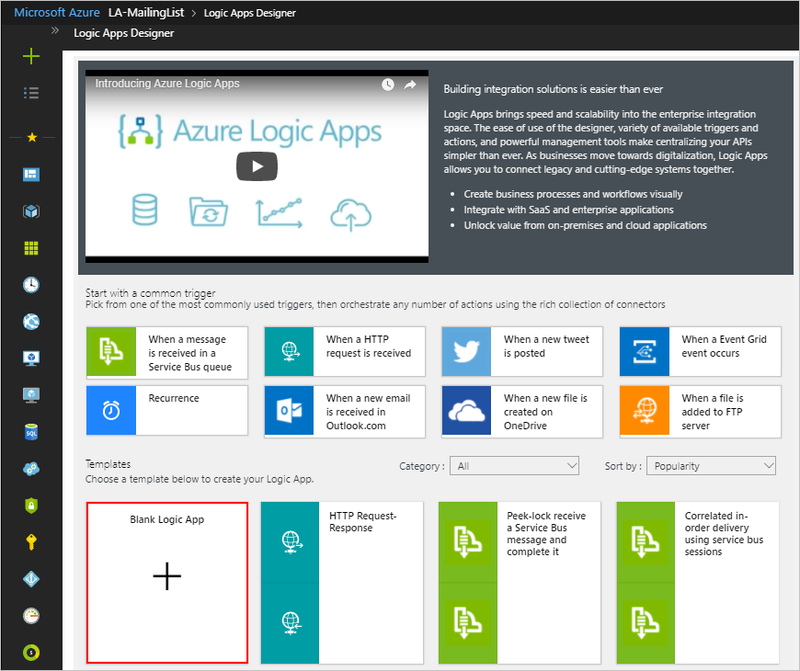 After Azure deploys your app, the Logic Apps Designer opens and shows a page with an introduction video and templates for common logic app patterns. Under Templates, choose Blank Logic App. Next, add a trigger that listens for incoming emails with subscription requests. Every logic app must start with a trigger, which fires when a specific event happens or when new data meets a specific condition. For more information, see Create your first logic app. 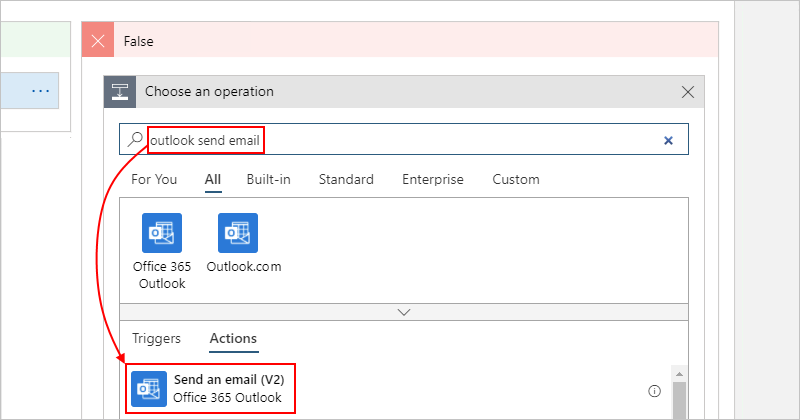 For Azure work or school accounts, select Office 365 Outlook. For personal Microsoft accounts, select Outlook.com. If you're asked for credentials, sign in to your email account so that Logic Apps can create a connection to your email account. Now specify the criteria that the trigger checks in all new email. 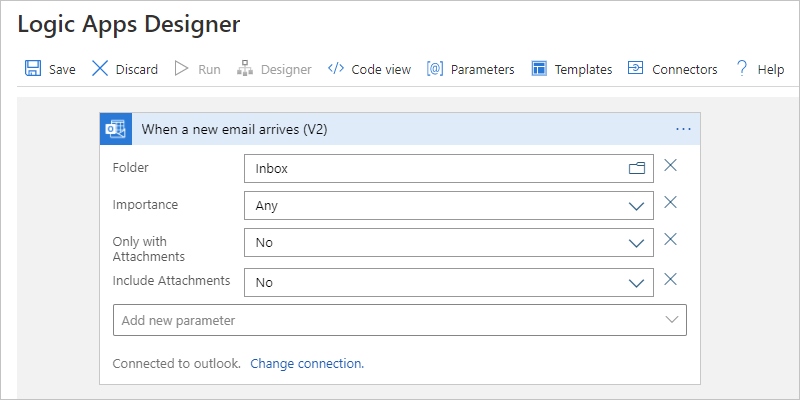 Specify the folder, interval, and frequency for checking emails. To hide the trigger's details for now, click the trigger's title bar. Your logic app is now live but doesn't do anything other than check your incoming email. So, add an action that responds when the trigger fires. Now that you have a trigger, add an action that sends an email to approve or reject the request. To <approver-email-address> The approver's email address. For testing purposes, you can use your own address. User Options Approve, Reject The response options that the approver can choose. By default, the approver can choose either "Approve" or "Reject" as their response. For now, ignore the dynamic content list or inline parameter list that appears when you click inside specific edit boxes. This list lets you select parameters from previous actions that you can use as inputs in your workflow. Your browser width determines which list appears. Next, add a condition to check the approver's chosen response. 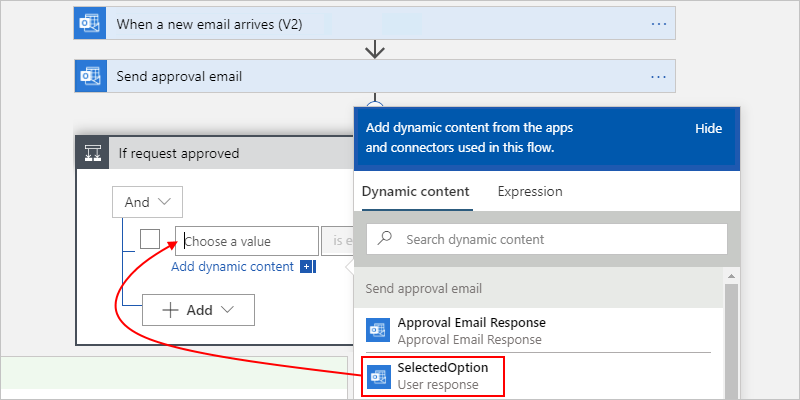 Under the Send approval email action, choose + New step > Add a condition. The condition shape appears, along with any available parameters that you can include as input to your workflow. Rename the condition with a better description. On the condition's title bar, choose ellipses (...) button > Rename. If your browser is in wide view, and the dynamic content list blocks access to the ellipses button, close the list by choosing Add dynamic content inside the condition. Inside the condition, click inside the Choose a value box, which is on the left (wide browser view) or on top (narrow browser view). From either the parameter list or the dynamic content list, select the SelectedOption field under Send approval email. Next, specify the action that your logic app performs when the reviewer approves the request. Now, add an action that adds the approved member to your mailing list. If you're asked to sign in to your MailChimp account, sign in with your MailChimp credentials. Status subscribed The subscription status for the new member. For more information, see Manage subscribers with the MailChimp API. 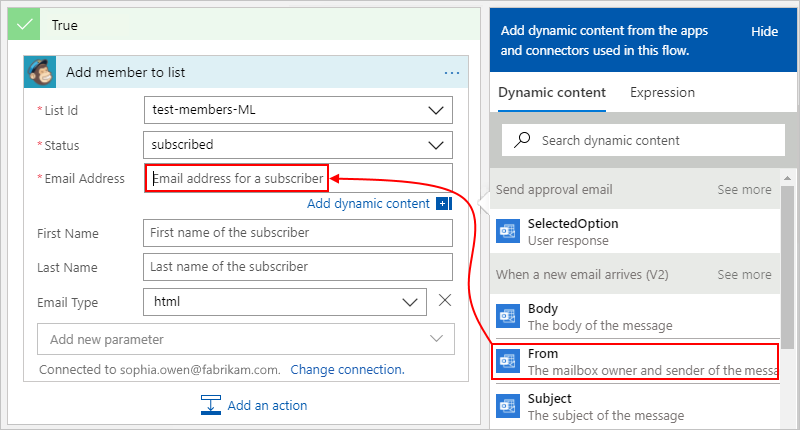 Email Address <new-member-email-address> From either the parameter list or dynamic content list, select From under When a new mail arrives, which passes in the email address for the new member. Next, add a condition so that you can check whether the new member successfully joined your mailing list. That way, your logic app notifies you whether this operation succeeds or fails. 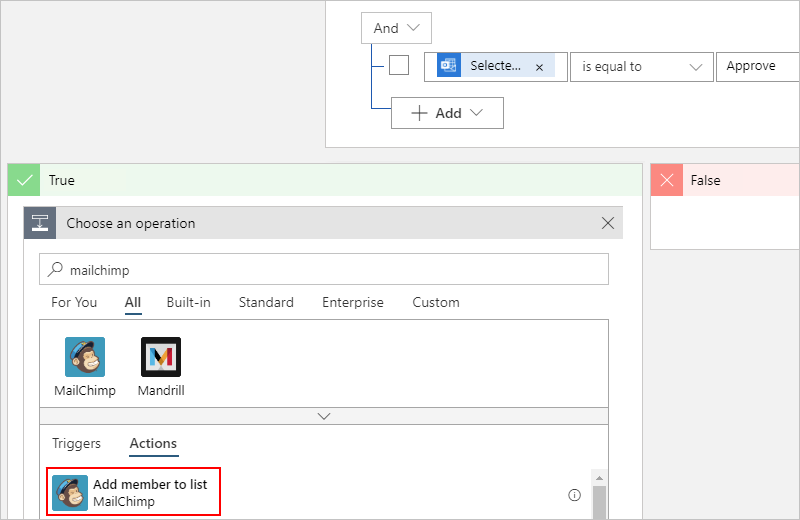 In the If true branch, under the Add member to list action, choose More... > Add a condition. Inside the condition, click inside the Choose a value box, which is on the left (wide browser view) or on top (narrow browser view). 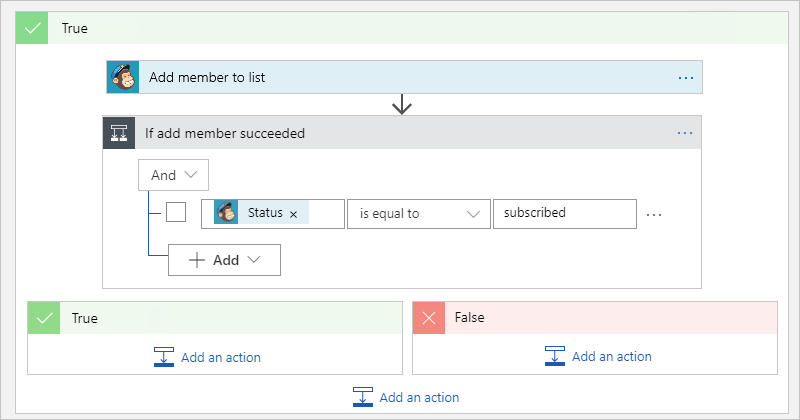 From either the parameter list or the dynamic content list, select the Status field under Add member to list. Next, set up the emails to send when the approved member succeeds or fails in joining your mailing list. In the If true branch for the condition If add member succeeded, choose Add an action. To <your-email-address> The email address for where to send the success email. For testing purposes, you can use your own email address. "Success! Member added to 'test-members-ML': Email Address"
"New member has joined 'test-members-ML': Email Address"
In the If false branch for the condition If add member succeeded, choose Add an action. To <your-email-address> The email address for where to send the failure email. For testing purposes, you can use your own email address. "Failed, member not added to 'test-members-ML': Email Address"
"Member might already exist. Check your MailChimp account." Send yourself an email request to join your mailing list. Wait for the request to appear in your inbox. To manually start your logic app, on the designer toolbar bar, choose Run. If your email has a subject that matches the trigger's subject filter, your logic app sends you email to approve the subscription request. In the approval email, choose Approve. If you don't get any emails, check your email's junk folder. Your email junk filter might redirect these kinds of mails. Otherwise, if you're unsure that your logic app ran correctly, see Troubleshoot your logic app. Congratulations, you've now created and run a logic app that integrates information across Azure, Microsoft services, and other SaaS apps. 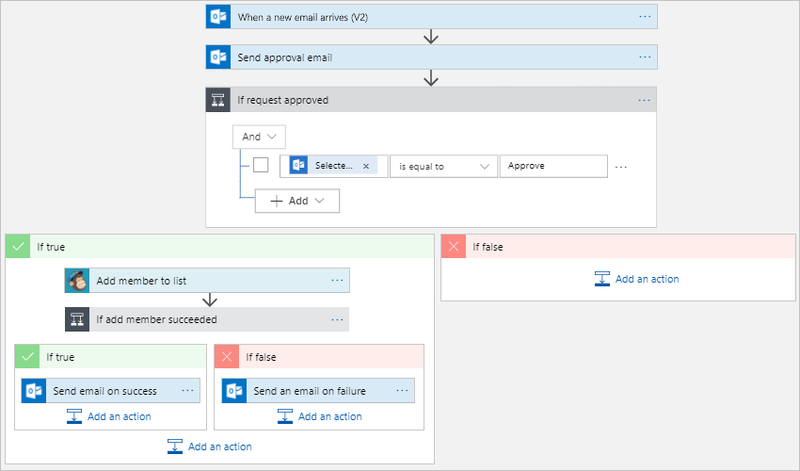 In this tutorial, you created a logic app that manages approvals for mailing list requests. 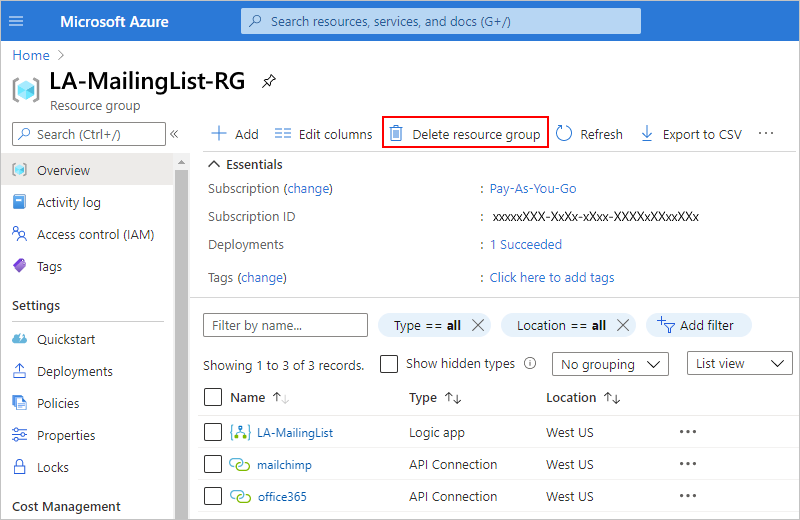 Now, learn how to build a logic app that processes and stores email attachments by integrating Azure services, such as Azure Storage and Azure Functions.